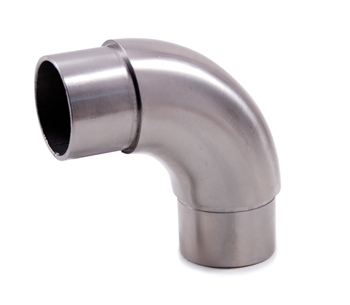 Stainless Steel Articulated Elbow 1 1/2" Dia. x 5/64"
This INOX Fitting has a articulated elbow and features a 1/16" external diameter. Stainless Steel Mounting Plate 45 Degree, For 1 1/3" to 1 2/3" Dia Tube Stainless Steel End Cap Rounded for Tube 1 2/3" Dia. Stainless Steel Bar Holder 13/32" Dia. Hole for 1 2/3" Tube Stainless Steel Sphere 1 3/16" Dia. Hole, 31/64" Dia. Stainless Steel End Cap Rounded for Tube 1 1/3" Dia. Stainless Steel Bar Holder 1/2" Dia. Hole for Square Tube Stainless Steel Flange Canopy 3 15/64" Dia. x 1 11/16" Dia. Hole x 19/32" Stainless Steel End Cap Semispherical for Tube 1 2/3" Dia.